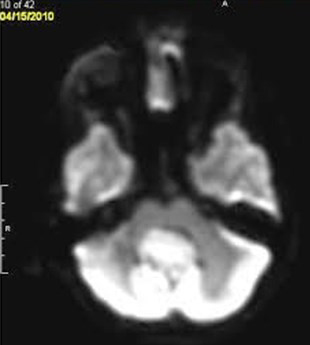 A 9-year-old boy presented with acute onset headaches, emesis, and truncal ataxia. CT (not shown) was performed initially, showing a posterior fossa mass with hydrocephalus and transependymal flow of CSF. 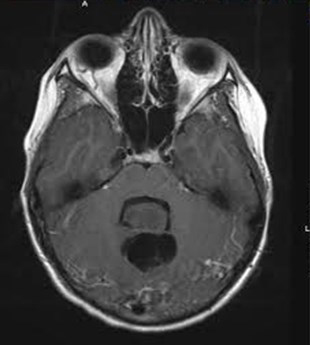 Axial MR images demonstrated a large midline posterior fossa mass with cystic components. Solid portion of the mass were hyperintense to white matter and isointense to gray matter on T2 (A), hypointense on T1 (B), and heterogenously enhancing (C). Increased signal was present within the mass on diffusion-weighted imaging (D). 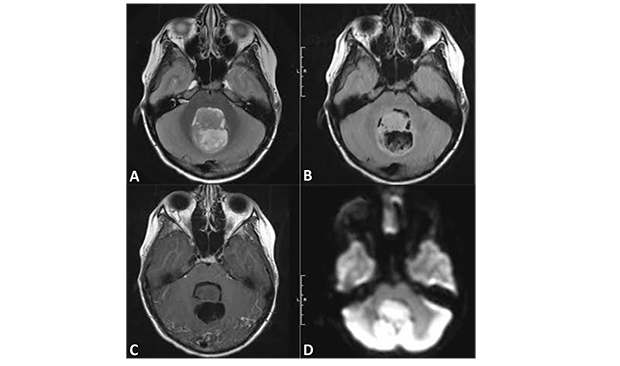 Medulloblastoma is a WHO grade IV tumor, most commonly affecting children in the first two decades of life; however, lesions may also present in young adults. 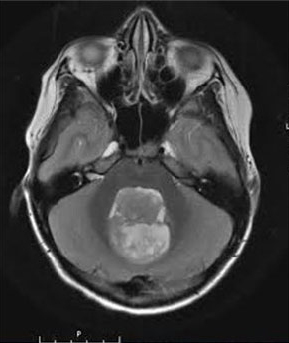 The tumor typically arises from the cerebellar vermis at the roof of the 4th ventricle; cerebellar hemisphere involvement is far less common and occurs more frequently in older patients. Patients commonly present with rapid onset symptoms of increased intracranial pressure due to obstructive hydrocephalus. CT typically demonstrates a well-circumscribed midline posterior fossa mass, hyper- (vast majority of cases) or isoattenuating to brain parenchyma with cystic features in roughly half of cases and calcifications in approximately 10-20% of cases. On MR, T1 sequences show iso- to hypointensity of the mass; T2 signal intensity is more variable. Prominent, heterogeneous enhancement is typical on both CT and MR. DWI characteristically shows restricted diffusion. Treatment includes surgical resection with chemotherapy and/or radiation. Due to frequency of CSF drop metastasis, imaging the entire neuroaxis is vital prior to treatment . 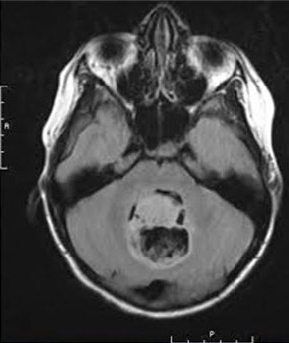 At the Viewbox: Medulloblastoma. J Am Osteopath Coll Radiol. Dr. Hostetler is with the Department of Diagnostic Radiology, David Grant USAF Medical Center, Travis Air Force Base, CA and, at the time of publication of this article, Ms. Widule was a medical student at the F. Edward Hèbert School of Medicine, Uniformed Services University of the Health Sciences, Bethesda, MD.